We all know them, the cats or dogs that just can’t seem to stay away. And the new kit Playful Pals by In The Small Things is a perfect kit to highlight some of those pictures throwing an ultra cute spin on it. 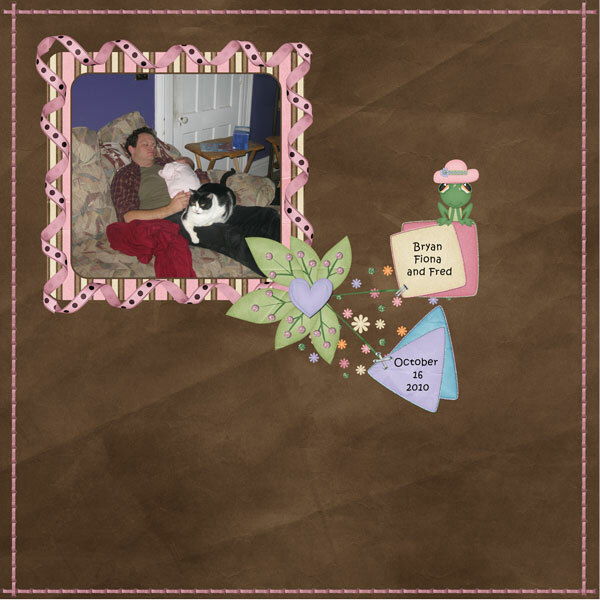 So here is mine… it is a picture of my brother-in-law asleep with my youngest and the cat, Fred, decided he had to join in on the action. After all the baby can’t be the only one getting attention right? This kit has so much more to it than I was able to show in this layout. Often I try to show more, but this layout I think is just beautiful in it’s simplicity. There is the kit, glittered papers, and a set of clusters that have been created for you to just download and use! You can buy all of the pieces this kit as a bundle at In The Small Thing’s store at either Polka Dot Plum or Stuff to Scrap. I’ve linked you to the bundle packs, because why wouldn’t you want all of it? 🙂 But if you can only get a piece or two then the kit, papers, and clusters are also available separately at each store. Now if I can just figure out how to make my pretty picture frame into something that I can give away as a freebie… We will see check back soon and you might just have a surprise that you can download!